A recently unclassified report by the United States Government Accountability Office (GAO) revealed that a United Nations body that runs hundreds of Palestinian schools failed to offset “potentially problematic content” in its textbooks, and that State Department documents on the matter contained either inaccuracies or omissions. Palestinian Authority textbooks used by the United Nations Relief and Works Agency (UNRWA) — which was cut off from US funding in August — have drawn mounting concern in recent years, with multiple watchdog groups accusing them of inciting violence and discrimination. Sen. Jim Risch (R-ID), then chairman of the Senate Foreign Relations Subcommittee on Near East, South Asia, Central Asia, and Counterterrorism, responded to the controversy in 2017 by requesting a GAO review of whether US aid is supporting educational materials that promote antisemitism or terrorism. The resulting report — covering the period between fiscal years 2015 through 2017, when the US provided some $243 million in education assistance to the West Bank and Gaza Strip — was released in April but remained classified, prompting calls from Reps. Lee Zeldin (R-NY) and Scott Perry (R-PA) in August to make it available to the public. While it did not independently evaluate UNRWA textbooks, the GAO report cited the results of a review process conducted by UNRWA that identified issues with 229 pages in textbooks used in the 2017-2018 school year. A majority of these issues related to neutrality or bias — for example, describing Israeli cities as Palestinian, referring to Jerusalem as the capital of Palestine, and failing to recognize non-Islamic religions observed in the region. To identify and address such potentially troublesome material, officials from the State Department and US Consulate General in Jerusalem (ConGen) reviewed studies carried out by nongovernmental organizations on Palestinian Authority textbooks, and have confirmed instances of problematic content since fiscal year 2015, according to GAO. The officials reported that they encouraged Palestinian officials “to address incitement to violence in textbooks” since 2015, and that Palestinian officials have complied. UNRWA likewise “took actions to address content it deemed as not aligned with UN values,” according to GAO, including by creating “complementary teaching materials” to be used alongside UNRWA textbooks. However, “due to financial shortfalls and other constraints,” UNRWA officials reported that teachers were not trained to use the materials, nor were they ever distributed to classrooms. 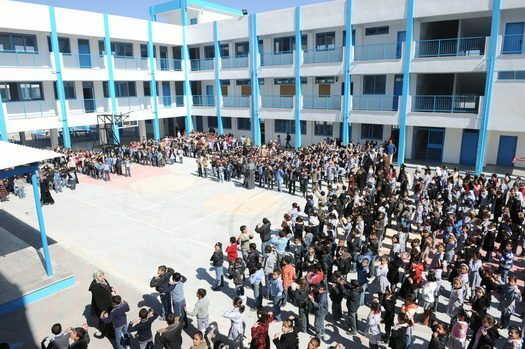 While the State Department issued reports to Congress during this time on the steps UNRWA has taken to ensure its educational materials are consistent with UN values, as legally required, “State included inaccurate information in the 2017 report and omitted potentially useful information in all three reports,” GAO noted. The GAO included four recommendations to improve State Department reporting to Congress, which were endorsed in subsequent comments issued by the department.